Last year I planted one blue hubbard squash start in the garden. I didn't know anything about this type of heirloom squash, but had picked it up at a garden center and wanted to try something new. It grew some of the ugliest squashes I had ever seen. Bulbous. When they fully mature, they turn a weird gray color and are massive in size. Most of mine reached 20+ pounds. I was a little scared of the first one, but was delighted when I tasted the creamy flavor. The blue hubbard squash stores very well in the winter. I put mine in the basement in September, after a brief cure in the sun. I just roasted my last one. It was just as firm as the day I picked it, even after six months of storage. And when I cut into it....glorious rich orange and just as much flavor as the ones I roasted last fall. Blue hubbards produce a lot of food! I roasted this last squash at 375* for 45 minutes, then put all the flesh in a blender to make puree. I filled up one 2 quart casserole dish to make as a side for dinner, and then froze another 10 cups of puree. The shell went into the compost bin. I always save some seeds to use for next year. I like to use the purees to make my version of pumpkin bread. Or maybe I should call it hubbard bread. You can find the recipe HERE - just sub hubbard squash puree for the cushaw squash. This time, I cooked the bread in my sun oven. It does a nice job baking breads - they just turn out slightly crooked because of the angle I have to put the oven on to maximize the sun exposure. The blue hubbard squash is win/win - you get a ton of food, it stores for a very long time, and it has excellent flavor. You only have to buy it once - it's an heirloom so you can reuse the seeds from year to year. If you haven't grown this before, it's my top recommendation for you to try in 2016. Happy planting! Hi Lisa, I have never tasted this squash. It sounds delicious and how fun to bake the bread in the sun oven. Thanks for sharing your experience with us. Looks good. Do the squash bugs attack it like other types? Looks good. I need a garden first! You are amazing, Lisa.... I love reading about your life and experiences... I've never heard of Hubbard Squash ---or if I have eaten it, I didn't know the name.... Thanks so much for sharing. 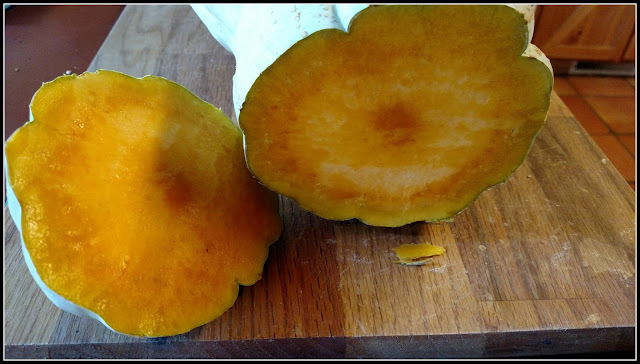 Interesting post on blue hubbard squash. I have never seen this squash before and neither have I seen a sun oven before. Does it taste better than yellow squash? I just don't like the taste of squash very much. Maybe because growing up it was cooked until it was mushy. I bet they are really good! I love squash. I make a Spaghetti Squash Pie a lot. I wish I had a place for a garden! Would love to taste some of your bread. How awesome that you could bake it outside like that. Sounds real good this time of year. I make a ravioli filling with it in a white sauce. I have to agree - you are quite amazing! Thanks for sharing this with us. So, you gotta fill us in...like how much room I need for this plant. I'm sort of scared of the size...will it overtake my city yard?? It sounds like it would be mighty good! 20 pounds! Wow, that is amazing! 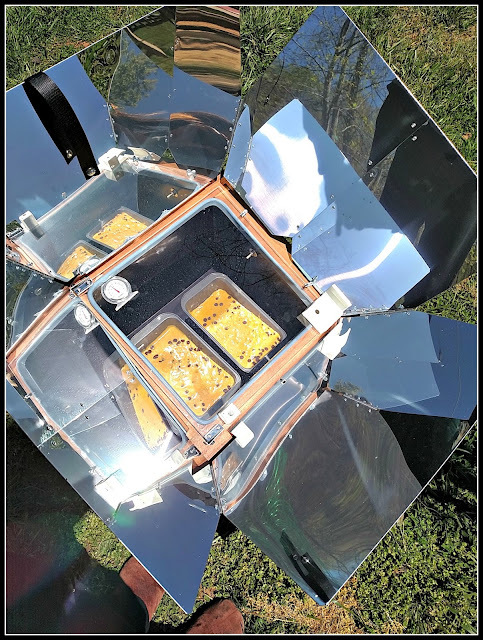 Your solar oven looks interesting, but I don't think we get them here in Europe, but I shall have a look. As for that squash, I shall have a look around for that as well! I've never heard of this squash, you are really teaching me new things this morning as I catch up with your posts!